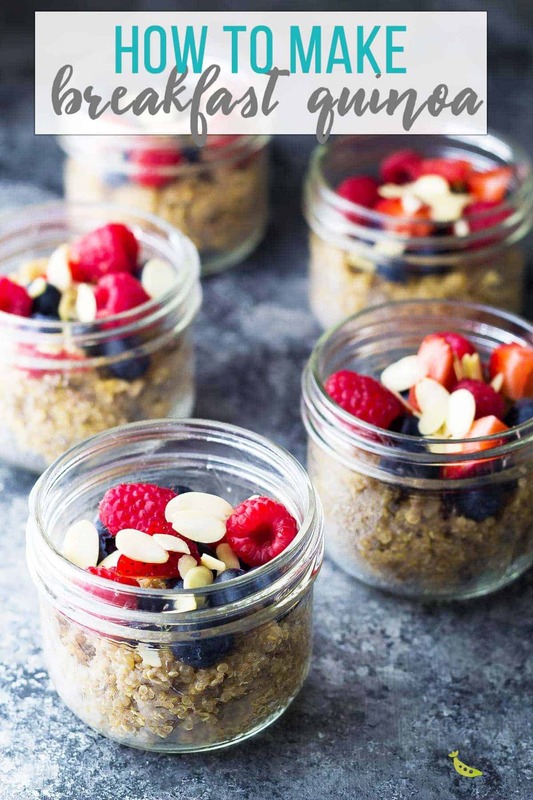 Berry quinoa breakfast meal prep is a great alternative to oatmeal! 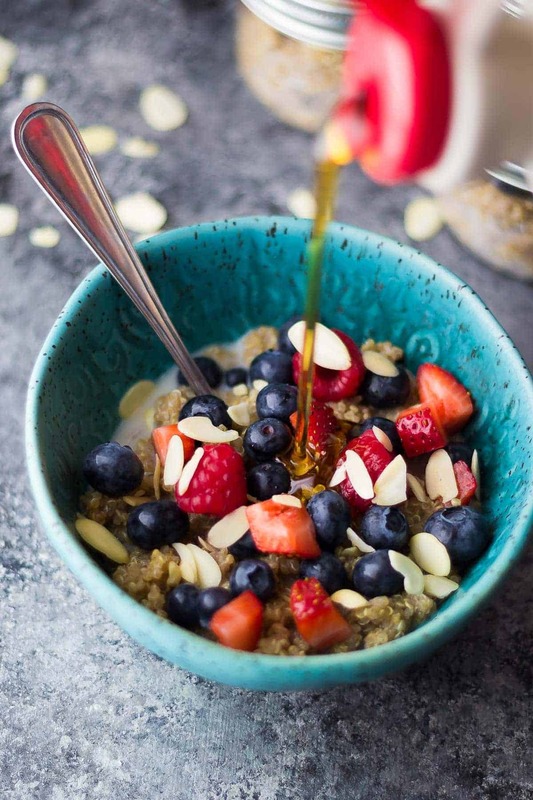 Simple and delicious with chewy quinoa, crunchy almonds and sweet berries. Gluten-free, vegan, clean eating, and prepped in under 30 minutes! Steel cut oats are one of my favorite breakfasts, but it is also great to mix things up once in awhile. 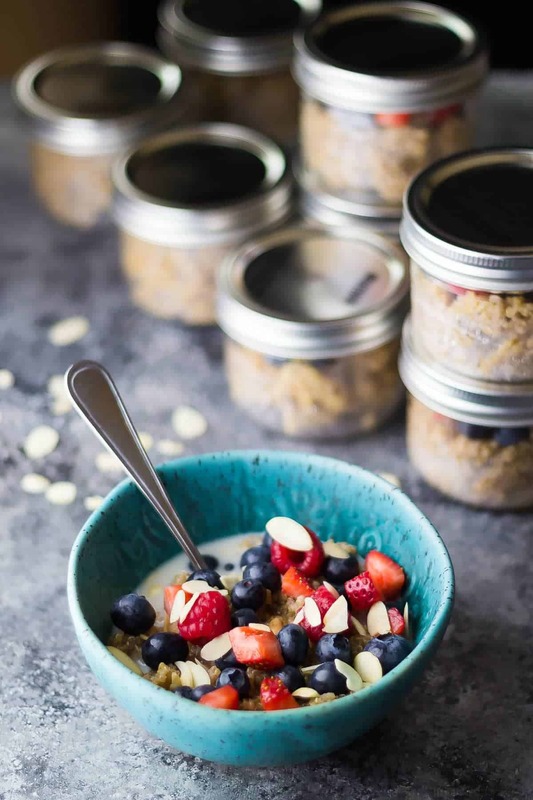 If you are looking for a meal prep breakfast oatmeal alternative, then this quinoa breakfast meal prep might be perfect for you! 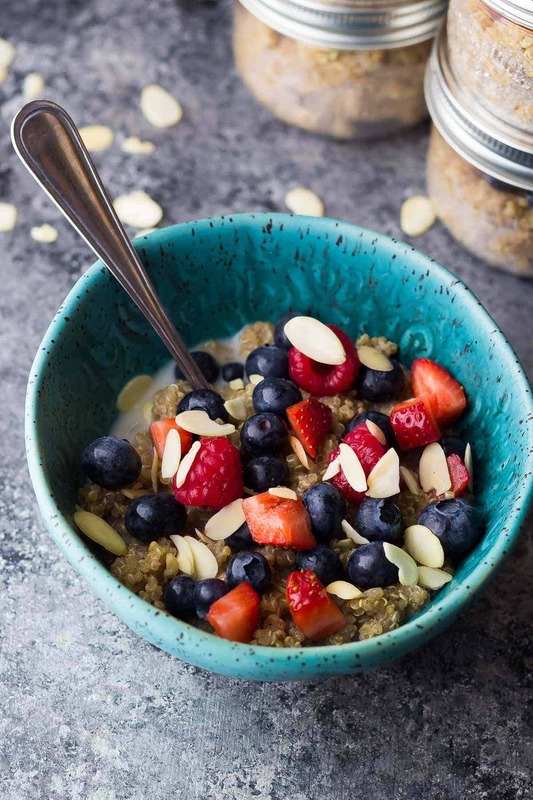 This quinoa breakfast recipe is slightly sweet (you can add as much or as little sweetener as you’d like), with chewy, nutty quinoa, crunchy almond slices and sweet berries. You can make this super hands off and cook your quinoa in a rice cooker, or you can prepare this on the stove top. Either way, this quinoa breakfast meal prep is ready in under 30 minutes, and is incredibly simple to prepare! Maybe eating quinoa for breakfast sounds a little strange to you, but stay with me! I promise, it is really yummy! To cook the breakfast quinoa, I simmered my quinoa in some almond milk, cinnamon and vanilla. If you are cooking in a rice cooker, I do not recommend using almond milk, as it froths up and bubbles through the vent, making a big mess. I use water instead, and it’s still very delicious! You could also prep this quinoa breakfast meal prep in your Instant Pot by cooking on high pressure for one minute, then naturally releasing for 15. 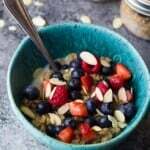 Let’s talk toppings and mix ins for quinoa breakfast bowls! 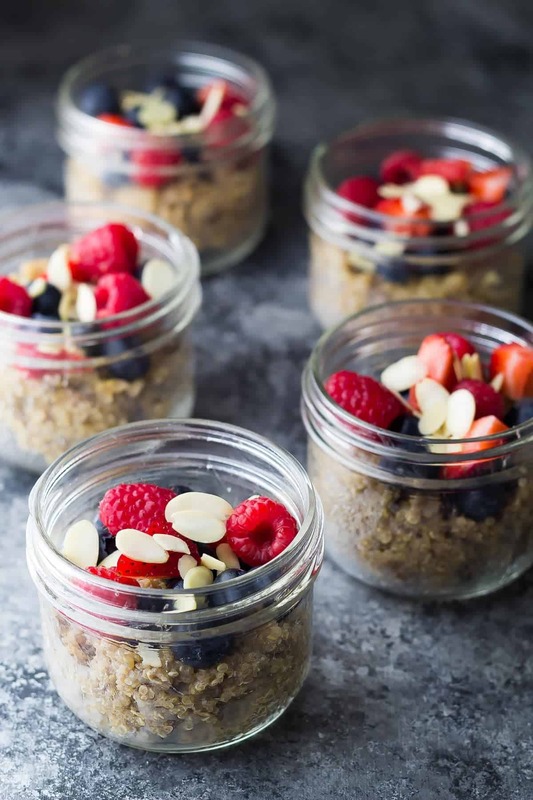 Like oatmeal, the sky’s the limit with this quinoa breakfast meal prep. I always sweeten with some maple syrup, about 1-2 tablespoons per batch. You can add more or less, depending on your preference. Nuts- for this recipe I used sliced almonds, but walnuts, pecans, macadamia nut would probably be great in here. Berries- pretty much any berry would do! I like to add in frozen berries and let them thaw on the quinoa overnight. Then you get those yummy berry juices mixing into your quinoa, plus it’s cheaper to buy frozen. Apples- you can mix in some unsweetened applesauce after cooking, and you can even cook some peeled and chopped apples into the quinoa while it cooks. Pumpkin- I haven’t tried but fully plan on stirring some pumpkin puree into my quinoa breakfast meal preps in the fall! Add some pumpkin pie spice and it’s going to taste like heaven! Peanut Butter- I like drizzling some natural PB on top of my breakfast quinoa just before serving. Do you eat this breakfast quinoa hot or cold? You can really go either way. Served cold, I top it up with almond milk and it’s kind of like a bowl of cereal (but much healthier for you!). You can also warm it up and enjoy it more like steel cut oats. Add as much or as little almond milk as you’d like before re-heating. 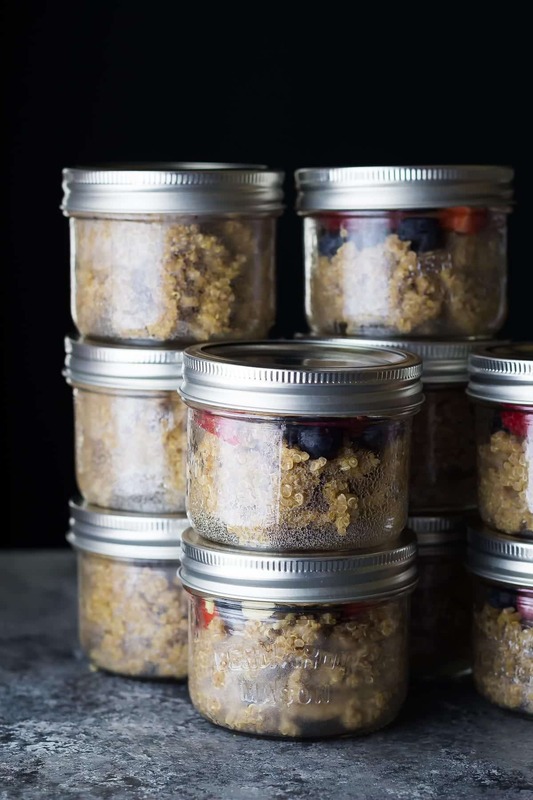 How long does this quinoa breakfast meal prep last? I store it for 4 days in the fridge. But guess what? It also happens to be freezer friendly, so if you want to prep a really big batch, you could portion it out and freeze for long term, thawing portions as needed. How can I make this breakfast quinoa more filling? To up the protein factor and make this more filling, you can add some protein powder, a dollop of greek yogurt, or a drizzle of nut butter.
. They are microwave and freezer safe! To reheat, simply add a bit more almond milk, stir it all up, heat for a minute or so on 80% so it is lightly heated. And enjoy! I love that you can just grab these out of the fridge and take them with you, so if you are in a serious rush, you still get to eat a nutritious breakfast. OK friends! That’s it for today. Looking for more easy meal prep breakfast recipes? Watch the video below to see exactly how I prepped my Quinoa Breakfast Meal Prep on the stove top. It’s so easy! You can find more of my recipe videos on my YouTube channel, or on Facebook. In a medium pot, combine the quinoa, almond milk, cinnamon, and cardamom. Bring to a boil, reduce heat and simmer for 15 or so minutes, until the quinoa is cooked through. Cool quinoa. Stir in the maple syrup, and divide into four containers: ¾ cup cooked quinoa, 1 cup fruit, 1 tablespoon sliced almonds. Instant Pot- use water in place of almond milk. Cook on high pressure for 1 minute. Allow Instant Pot to naturally release. Rice Cooker- use water in place of almond milk. Use the 'white rice' setting if there is one on your rice cooker. *For the Instant Pot or rice cooker, make sure to use water, not almond milk. This was a winner! I am not the biggest fan of quinoa, but it was so good! I loved the cardamon flavor and the sweetness of the maple syrup. Thank you for sharing! Was just wondering is it okay to use Soy Milk instead of Almond Milk? ? Hi Jeremy! I haven’t tried but I don’t think that would be a problem at all. Hope you enjoy! Why “not unsweetened almond milk”? I found that it needed that extra sweetness from the regular almond milk. You could always use unsweetened then add a bit more maple syrup, though! I was going to ask the same thing as I am watching my sugar intake and I like the Unsweetened Almond Milk better anyway. 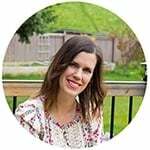 I just found this site and signed up for the Lunch Prep challenge. So excited to get started. Absolutely, if you use unsweetened, you may wish to adjust the maple syrup. I hope you enjoy, Paula and look forward to having you in our challenge! What a fantastic challenge, Denise! I’m with you on a make ahead breakfast. Mornings are so dang full, it’s nice to know there’s one thing already taken care of. Also, having a nourishing breakfast on the ready means I don’t grab something not so good for me to get the day going. I love these little grab n’ go breakfasts! I had to go join the FB community immediately…I need breakfast help!! So sign me up for this challenge and I’ll pin this and any other make ahead breakfast recipes. Love!! I love the idea of a make-ahead breakfast challenge! Eating a good breakfast is so important because it often encourages better choices the rest of the day. As much as I love quinoa, I’ve never tried it for breakfast. I don’t know why. It has such a delicious nutty flavor that would be great with berries and almond milk. I need to try this soon! OK, you’ve got me thinking about quinoa for breakfast. I’ve never been a big fan of quinoa as a pasta substitute, but I might really like it as an oatmeal substitute. I have all the ingredients in my pantry, minus the cardamom, since I’m allergic. I’m giving this a try! I love make ahead breakfasts because I’m so lazy, and quinoa is just delicious in place of oatmeal! I haven’t made breakfast quinoa in so long and really need to get on these! I love make ahead breakfast ideas like this! Sounds delicious and healthy too!